Twenty-three students from Holyoke Elementary School competed in the Eleventh Annual Sunrise Optimist Brain Bowl at Ft Morgan High School on Saturday January 28, 2017. Thirty-three teams of students from schools in Northeast Colorado participated in the competition. Holyoke had four teams participate and each team consisted of 5-6 members who buzzed in to answer questions in the categories of literature, science, math, history, technology, sports, spelling, grammar, current events and trivia. The Holyoke A Fifth-sixth grade team finished in third place. A single point dashed their hopes of participating in the championship round, but they proudly wore their third place medals home. The Holyoke B Fifth-sixth Grade team finished in fourth place a point behind the Holyoke A team. The two Holyoke third-fourth grade teams tied for fourth place out of sixteen teams also missing the championship round by a hair’s breath. 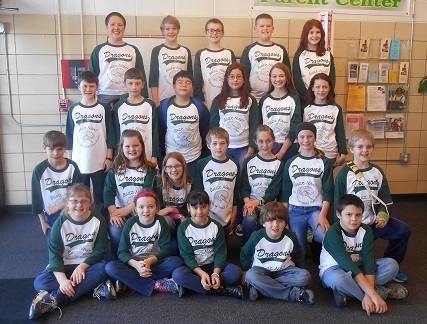 Proudly displaying their Dragon Brain Bowl shirts, Holyoke students were excellent representatives of their school and community by displaying good sportsmanship and respect. A large crowd, mostly made up of parents, teachers and administrators, came to cheer on the students who have been preparing for the competition for the last few months. The competition was close and Brain Bowl rules were strict: pronunciation counted, as well as spelling, and pressing the buzzer at the wrong time could cost a team points. Students were chosen to participate on the team based upon a general knowledge assessment. Volunteer coaches for the Brain Bowl teams were teachers Christina Martinez and Laura Loutensock. Back Row: Isaiah Rahe, Max Kleve, Joseph Schroetlin, Ethan Schneller, Madysen Powell. Brendan Nelson, Copper Goldenstein, Edel Ramos, Andrea Marquez, Anna Hayes, Adison Goldenstein. Matthew Murray, Sawyer Sigler, Layna Wear, Tyler Bergstrom, Nicole Schlacter, Tayla Martin, Ben Kleve. Front Row: Leah Struckmeyer, Neveah Speicher, Dahira Castillo Marquez, Mason Sprauge and Peyton Marlow.